6 Hour Deep Sea Fishing Charters are the best trips we offer. We are different than all other fishing charters in Orange Beach. We are always upbeat and happy to meet our new customers and see our old friends. 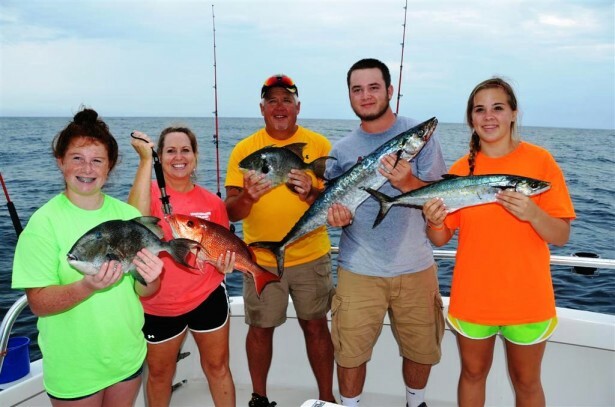 We are educators that put your family at ease, while providing you with the best fishing trips and charters in Orange Beach. When you allow us to serve your family, you will feel calm and confident that you are about to have the best experience around. We don’t expect you to know anything about deep sea fishing. For that reason, we are extremely gentle with you and don’t throw too much at you at any time. We let you engage at your own pace. However, we do encourage you and your kids to come out of their shell of shyness and grab a pole and learn something new. It’s OK if some of you or your kids don’t engage until they feel a little more comfortable with what we are doing. Some people are more comfortable just sitting back and watching everyone else for a little while, and that is OK with us. We don’t overwhelm you with lists of rules, nor do we bark orders at you like a grumpy old military drill Sergeant. We educate and then demonstrate how to catch these fish. If you are doing something incorrectly, we will gently come over to you and calmly instruct you how to do it correctly. We are professionals and we act professionally at all times on our fishing trips. We have a servants attitude at all times. You will never hear me yell, scream, curse, lose control or do anything that elevates tension or stresses you out. We do however get excited when you hook a big fish or catch a trophy. 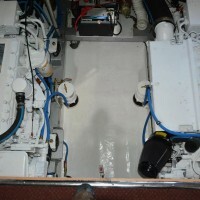 Your deckhand is like the captain. He too, is very laid back and easy going with your entire family while interacting with you. He too will never stress you out. When you allow us to serve you, your family will learn basic knot tying and angling skills so you will be catching fish all by yourself. 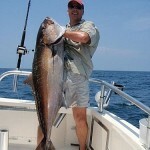 The most popular fishing trip in Orange Beach is the 6 hour charter. We offer 2 of these half day trips daily, from May to August. This is the time when we have at least 12 hours of daylight to operate in. During other times of the year, we may only have time for a single 6 hour trip and maybe a 5 hour afternoon trip. We care about safety and want to keep you fishing in daylight hours only. 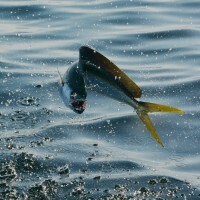 Be sure to read our page named what to expect while charter fishing. It has a lot of information on it. The half day (6 hour) trip is perfect for families and first timers. 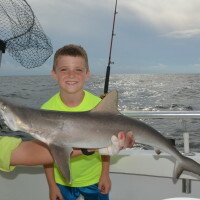 The best trip for families and first time anglers is the half day, 6 hour trip. 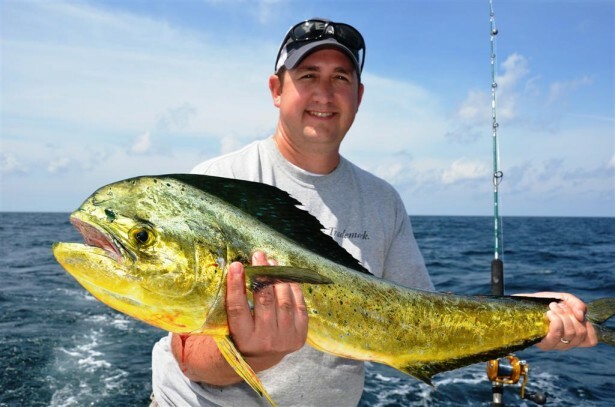 These trips actually budget for fuel and get you far enough offshore to where you will have a greater chance to catch more and sometimes larger fish. 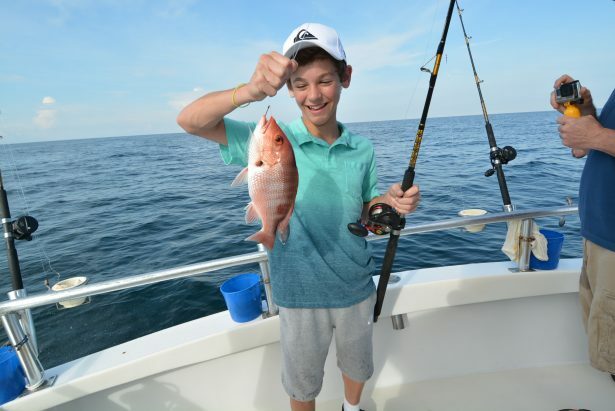 Due to seasonal closures on fish species like red snapper, triggerfish and greater amberjack, you may not be able to keep any or all of the fish you catch. 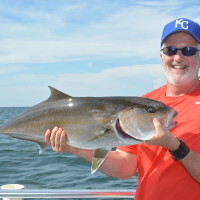 Even though there are some amberjack and grouper around, they are usually way offshore in the 10 hour or full day territory. If you want a chance at them, you need to book a longer trip. This 6 hour trip is the trip that made our business what it is today! We are the first fishing charter to specialize in educational based, conservation oriented, action packed family fishing adventures. What we do for families is so totally different than any other charter around. The half day or 6 hour fishing trip is our cornerstone trip. 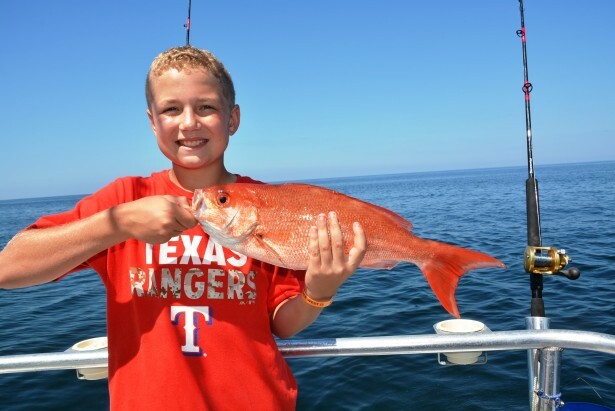 During the summer months of Memorial Day to Labor Day, we offer two fishing trips daily. These trips are ideal for those who have never been fishing before or who are short on time or have not budgeted for a longer more in depth, all day trip. These fishing trips offer a little education, a little bit of bottom fishing and a little bit of trolling before it is time to head back to the dock in hand with a lot a memories and possibly a few fish for supper. We usually catch a lot of fish on these trips, but because of regulations and short seasons, most of these trips catches are released after being photographed. 5 hour trips are for fun, not food. They are an introduction to fishing and are designed to make sure you bend your pole or catch a fish. You may or may not catch something that is in season or edible. The 5 hour Spring and Fall trip is a featured off season fishing trip that begins after August 20 and is offered to May 20 each year. We also offer a 5 hour afternoon trip during June, July and August, which is our peak revenue season. The 5 hour trip takes you offshore about 8 to 12 miles, to the beginning of the 6 hour territory where you will learn how to deep sea fish. Important: We have had anglers in the recent past book one of these shorter trips hoping to save a few bucks and catch a mess of fish for dinner. They did not get the results they expected. Now, they caught a lot of fish, but they didn’t catch any whoppers like the news media said they would catch. We are going to tell you up front that you may not catch any keeper fish to eat on a 5 hour trip. We do catch quite a few smaller fish like red snapper and triggerfish on these trips, but because they are out of season most of the year, must be released. Sometimes, triggerfish are open during the spring months of March, April and May, but can’t guarantee it will be open during your trip. If keeping fish is important to you, you need to book your trip when the seasons are open to harvest or book a longer trip so we can take you out to where different varieties of fish like vermilion snapper and red porgy live, and are always in season. Sometimes when the water is warm and we come across some sargassum weed or a rip line, we can find dolphin fish swimming around. Any floating debris we find may hold these beautiful fish. 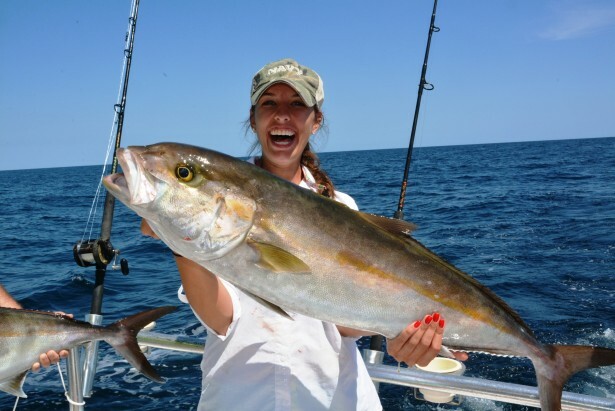 Learning to Jig for big amberjack can be exhaustingly rewarding on our longer full day trips. You have to be real lucky to get one of these big fish to the boat using light tackle.